There were two bracelet winners on Wednesday at the 2018 World Series of Poker, and one of those wins has provided one of the coolest stories of the summer so far. Meanwhile, two tournaments will return tomorrow very close to the end, with one heads-up and another three-handed. The final table of the SHOOTOUT has also been set, while the $25K PLO High Roller played through its Day 1. Here’s everything you need to know about June 21’s WSOP action. 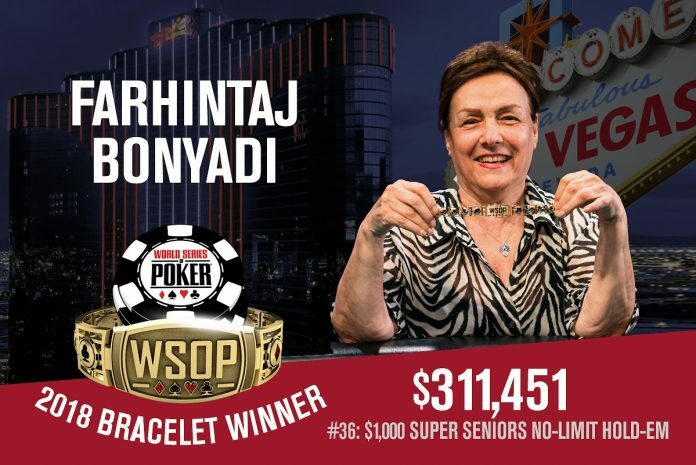 Against all the odds, Farhintaj Bonyadi defeated Robert Beach heads-up to capture her first WSOP bracelet and the $311,451 first-place prize. She’s now the second bracelet winner in her family, with her son Farzad “Freddy” Bonyadi holding three. The two returned to finish off Event #36: $1,000 Super Seniors No-Limit Hold’em today, with Beach holding a huge chip lead. He had 9 million to Bonyadi’s 2 million, but Bonyadi began to chip up almost immediately, winning several pots without showdown. That gap was closed to a 2:1 chip lead, and then before you knew it Bonyadi held the lead herself. In the final hand, there was a straight on board by the river and Bonyadi triple-barrelled to put Beach all-in. He made the call, having flopped top pair, but Bonyadi had the top end of the straight to secure the win. “I’m just so happy,” added Farhintaj, who claims her first tournament victory after two runner-up finishes in the Rio Daily Deepstacks in 2012 and 2016. The second winner of the day had to battle his way through the whole final table on his way to victory. 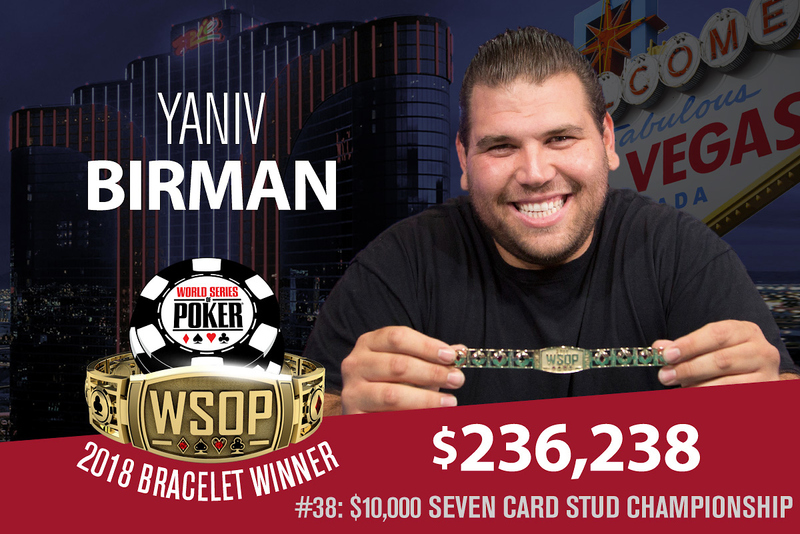 Yaniv Birman entered the Event #38: $10,000 Seven Card Stud Championship finale with the chip lead, and successfully overcame a tough final table to bank the $236,238 and the bracelet. Along the way, Lars Gronning was the first to fall. He came in as the short stack, and his elimination was quickly followed by the player who eliminated him, Joseph Cappello. James Obst then exited, before Matt Grapenthien and Lee Salem followed suit. Birman never lost the chip lead, despite not eliminating a single player until heads-up. Bracelet winner Ben Yu went out in third, leaving Birman to duel with two-time bracelet winner Jesse Martin. Martin managed to double up, but couldn’t pick up any steam from there. “I barely ever play tournaments so it’s fun,” Birman said after his win. “I play once or twice a year. I got here Monday, and this was the first tournament I signed up for. The truth is I don’t play much poker anymore. Stud is my favourite game – all types of Stud. I play a lot of high-limit games in L.A.
One of the two tournaments to play down to just two or three players remaining is Event #34: $1,000 DOUBLE STACK No-Limit Hold’em. Robert Peacock enters the fifth and final day as an overwhelming chipleader with 38,200,000 chips. Joining him will be Nicholas Salimbene (10,400,000) and Joshua Turner (8,400,000). Twenty players returned today, and along the way the likes of Ramin Hajiyev (15th Place – $34,929), Matt Stout (12th Place – $44,407), and Keith Ferrera (11th Place – $44,407), and Tomas Teran Paredes (10th Place – $44,407) exited before the final table was set. Jacky Wong (4th – $219,952), Ralph Wong (5th – $165,342), Daniel Eichhorn (6th – $125,215), James Ostrowski (7th – $95,538), Pfizer Jordan (8th – $73,446), and Takao Shizumi (9th – $56,891) rounded out the final table. The final three return at 12pm Thursday to find a winner. Blinds will be 500K/1M. The other near-finish on Wednesday night was in Event #37: $1,500 No-Limit Hold’em, which played down to just two. When action resumes tomorrow, it’ll be Eric Baldwin (7,550,000) heads-up against Ian Steinman (2,200,000). Baldwin seeks his second bracelet, having won his first back in 2009, while Steinman will have to overcome a healthy chip deficit to win his first. Throughout the day, we lost the likes of Ryan Goindoo, Thomas Kurtz, Ryan Laplante, Enrico Rudelitz, Jason Wheeler, Kirk Banks, Jay Farber, JC Tran, and Geoffrey Lavinson prior to the final table. The final table so far has seen the eliminations of Enrico Rudelitz (3rd – $140,957), Aaron Massey (4th – $101,819), Robert Georato (5th – $74,434), Michael Finstein (6th – $55,077), Stephen Song (7th – $41,257), Gilsoo Kim (8th – $31,290), and Mathew Moore (9th – $24,032). Things kick off again at 12pm Thursday with blinds at 50K/100K. At the start of play on Wednesday, 100 players who won their first round tables returned to the Rio to sit around ten ten-handed tables to play round 2. Unsurprisingly, ten players made it through to Day 3 – the final table. There’s no major chip leader in Event #39: $1,500 No-Limit Hold’em Shootout, as all ten players start with near enough the same stacks. Anthony Reategui is one notable to look out for though, as he finished seventh in the $3K SHOOTOUT a couple of weeks ago. Reategui also won a bracelet back in 2005. There were a bunch of notables who failed to win their second tables today, including Scott Blumstein, Phil Hellmuth, Rep Porter, Philip Tom, Justin Liberto, Vlad Darie, Georgios Sotiropoulos, Tom Hall, Demosthenes Kiriopoulos, Arkadiy Tsinis, Jesse Sylvia, William Kakon, and Matthew Waxman. You’ll find the line-up for tomorrow below. Play gets going at 12pm. They’re down to another final table over in Event #40: $2,500 Mixed Big Bet, and it’s Scott Bohlman who bagged the chip lead when play ended five-handed. And when we say chip lead, we mean a monstrous dominating lead that sees Bohlman holding 60% of the chips in play. His 1,556,000 is most closely followed by Ryan Hughes with 345,000. His huge surge came from several big pots, including making a wheel in a Pot Limit 2-7 Triple Draw hand to eliminate Dario Sammartino. They’ll return to play down to a winner at 2pm Thursday. A new event kicked off on Wednesday: Event #41: $1,500 Limit Hold’em. It attracted 596 runners, but after ten levels just 174 were bagging up chips. Brian Vollick had the best day of the lot, ending proceedings with 71,500. Other big stacks include Rex Clinkscales (69,900), Kurt Maier (68,200) and Jeremy Heartberg (66,200). A few notables who tried and failed in this one include Daniel Negreanu, Andre Akkari, Mike Leah, Humberto Brenes, Phillip Hui, Michael Moore, Todd Witteles, Ryan Laplante, David ‘ODB’ Baker, Chris Ferguson, and Luis Calvo. When the return tomorrow for Day 2, the blinds will be 1K/2K. Well, Daniel Negreanu must have dashed straight over to Event #42: $25,000 Pot-Limit Omaha 8-Handed High Roller after busting the Limit Hold’em, and it proved to be a good decision. Negreanu ended the day with the third largest stack out of the 101 survivors, behind only Konstantin Beylin (617,500) and Veselin Karakitukov (549,500). In total there were 192 entries, but registration is still open until the start of level 13. They played 10 levels today, and a few notables who made it through include Chance Kornuth (473,500), Robert Mizrachi (453,000), Artem Babakhanyan (436,000), Chris “BigHuni” Hunichen (374,000), Scotty Nguyen (347,500), Jason Koon (325,000), Brian Rast (312,500), Paul ‘paulgees82’ Volpe (258,500), defending champion James Calderaro (234,500) and Tommy Le (230,000). Play resumes at 2pm tomorrow with blinds at 1,500/3,000. There are two new events kicking off on Thursday. First up is Event #43: $2,500 No-Limit Hold’em, starting nice and early at 11am. Then at 3pm, there’s the Event #44: $10,000 Limit 2-7 Lowball Triple Draw Championship. Ben Yu took that one down last year for $232,738, defeating Shaun Deeb heads-up.